When a new employee is scheduled to start in your organization, an informal welcome letter makes the employee feel cared about and wanted. It is his or her first impression about starting a new job in your organization. It is also the first step in your campaign to retain the new employee. Retaining good employees starts with how they are welcomed into the organization and whether they feel important and needed. A new employee welcome letter helps the new employee get off to a positive start. It helps the new employee feel comfortable and confident as he or she starts a new job. You don't have to use a lot of words to write a basic employee introduction. 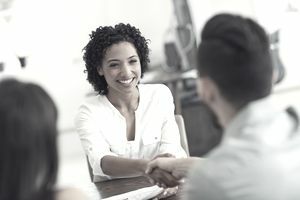 Sometimes, time or other events preclude the opportunity to write an employee introduction that includes the background and experience of the new employee. The simple introduction flags your other employees that there is a new kid on the block. It allows them to extend a welcome when they see an individual that they don't recognize. It, in turn, helps the new employee feel appreciated and welcome. And, when time permits, you have another opportunity to send out another email that includes the new employee's work experience. Clarification of her new role in your company for the employees with whom she will most frequently interact is also helpful so that employees know where their role leaves off and hers begins. It's better to write a basic introduction than to ignore the new employee joining your team. Here are sample basic employee introductions, an integral component in how you welcome new employees to your team. Tom Palazzolo is joining the team in a channel sales job starting this Tuesday. Tom brings a wealth of knowledge and experience to his new job. He'll be sitting with the other channel sales specialists in the sales wing. We've added Tom to the staff directory on the wiki. So, don't be a stranger; stop by and welcome Tom to our team. I'll send you more information once Tom arrives. When your time permits, and especially if you take the time prior to the starting date of a new employee, you can more creatively welcome your new employee. You can send a welcome letter with enough information that the new employee's first day jitters are bound to disappear. This new employee, Robert Martin, is joining the company in a training and development role, but you intend to make him the manager of the group after he is trained and demonstrates the team building skills you need from an individual in that role. We can hardly wait for you to start work at Smith-Klein. Your first day, next Tuesday is already full of meetings and opportunities for you to meet people with whom you’ll work closely. The team plans to take you out to lunch for your first day, so please reserve that time for the team lunch. As your new manager, I plan to take up the first couple of hours to review your new job and provide your orientation information. We have set up a 90-day new employee orientation for you which provides at least one activity a day that will help you settle in. We believe that this drawn out orientation lays the appropriate groundwork for your success. We custom design one for every new employee based on the job and the new employee’s experience. As days go by, we can add to the plan as appropriate and deemed necessary for you as you take on your new role. 8:30 a.m. – 10:30 a.m. - Welcome meeting with me in my office to cover the basics about your new role. 10:30 a.m. – 11:30 a.m. – Settle into your new office. Mark Maroney from IT will join you to make sure that your laptop, smartphone, and email settings are working and meet your needs. 11:30 a.m. – 1:00 p.m. – Lunch with the training and development team. Meet by the front door. 1:00 p.m. – 1:30 p.m. – Office time. 1:30 p.m. – 3:00 p.m. – Review and training on our products. You’ll need to understand what they do in depth. One of the trainers, Allan Snyder, will work with you. You can schedule additional time with Allan later this week. 3:00 p.m. – 4:30 p.m. – Meeting with Marcia Anatoli, the VP of finance to understand how finance and accounting operate and interact with your new role. Her staff will help you with all of your new employee paperwork, too. 4:30 p.m. – 5:00 p.m. Office time. Your second day will involve the Human Resources component of your new employee orientation. Our HR manager, Dennis Birnbaum, is looking forward to spending some time with you. The afternoon will be spent in the customer service department observing our interaction with customers. We want you to experience each department early in your orientation so that our company makes sense to you. Working in customer service will give you a good feel for the needs and challenges that our customers experience in using our products. It is also important that you understand how your role has to interact with each department. It is my pleasure to welcome you to Smith-Klein. I trust this letter clears up any concerns that you may have had about starting your new job. If you have questions or need additional information, please feel free to call me. You will receive your new employee orientation package and the new job paperwork packet from Human Resources in the next day or two. If you have questions about the orientation package, please call our HR manager.